Meiji era shallow bowl shaped in the form of an awabi (abalone) shell. 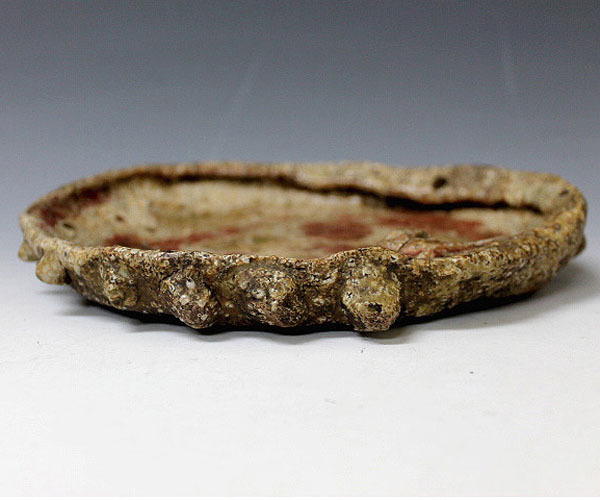 The extremely rough texture of Iga ware skillfully mimics the texture of abalone shell on the outside, while the plate surface is glazed smooth. Abalone plates are often used to serve sashimi. Top with bamboo leaves and/or ice for a stunning effect. Please note the extremely realistic detail of the clay sculpting, which can be seen well on the side view and detail photos. There is also a box.